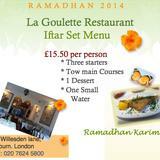 La Goulette is an authentic Tunisian restaurant on Willesden Lane that takes its name from the main port of Tunis. 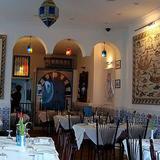 Expect a friendly atmosphere and faithful recreations of Tunisian classics. 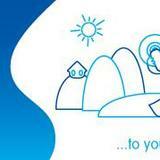 Do you work at La Goulette? What did you think of La Goulette? 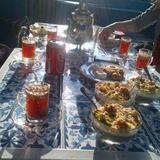 A simple, no-frills restaurant on Willesden Lane, serving authentic Tunisian fare in quiet surroundings. Tucked away in a corner on Willesden Lane, La Goulette doesn't exactly look much from the outside. However, inside the décor looks well thought out, with a white and blue theme throughout, reminiscent of traditional Tunisian houses. Simple, but nice enough. La Goulette has recently reopened and it is clear that they still need to tweak a detail or two. It does have a clean, pleasant décor, but they could do so much better in terms of ambience: Al Jazeera TV constantly plays on the LCD television right above the entrance and the lighting is set too brightly for a restaurant so there is a lack of intimacy (tables are set with some lovely candle holders... but are all empty) and it looks more like a living room, than a cosy neighbourhood restaurant. Indeed, it is clear that at La Goulette they are keen on delighting their customers: complimentary appetisers are brought with the menus, and the waitress won't refrain from refilling the bread basket. However service also needs improvement on some basics, like serving the correct wine or getting the timings right when bringing food to the table. The food is very simply prepared but is fresh and very good. And at about £3 for a starter and less than £10 for a main, it is definitely good value. As a starter, the lamb sausages (merguez) have a lovely, smoky flavour, with just a hint of spice. Grilled meat dishes feature prominently among main courses too, and they come perfectly cooked with a side of rice and tastira (a traditional side of fried peppers and eggs). Couscous dishes are pleasant but nothing memorable, with the couscous itself a little on the dry side with little meat to accompany it. The grilled seabass, on the other hand, is excellent, with strong – but not overpowering - hints of garlic and rosemary that greatly complements the mild flavour of the fish. A wine list with a taste for the unusual is definitely one of the greatest assets of this restaurant. Even the house wine (£11) is pretty good, though the Lebanese wines (Wardy Clos and St Thomas, about £15) are the real stars here. 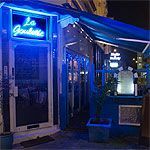 La Goulette does not impress for its location or ambience but the food is well above average, with excellent wine to accompany it. With a few improvements, La Goulette has potential to become a real locals' favourite.